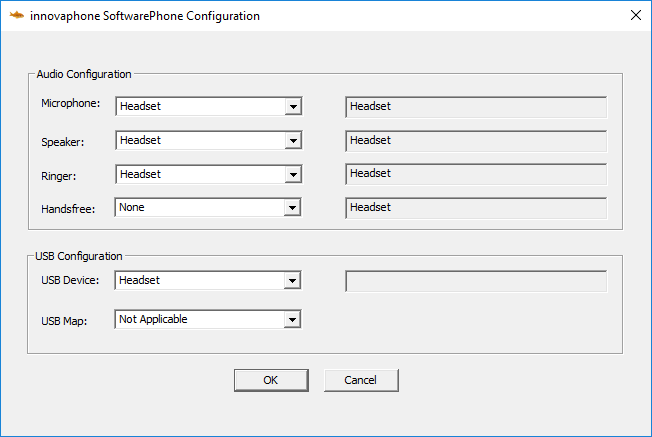 4.1 „Audio and USB Configuration"
Innovaphone SoftwarePhone is the implementation of innovaphones HW phones software as a Windows process. So all the features native to the hardwarephones are present in SoftwarePhone as well. SoftwarePhone has no UI, it is operated via myPBX or 3rd Party CTI client (ex: Estos Procall). Innovaphone PBX with SoftwarePhones<v> License. Resetting to default configuration could be done by deletiong the config files in the Roaming Directory. The configuration is opened by selecting “Configuration” from the start menu. A browser connection is opend to the server running as part of SoftwarePhone and the configuration menu is displayed. The Applicatons run mode and priority can be set and whether to register with the computers name at the PBX. The desired audio devices can be selected. The Audio –Input, -Output and –Ringing device can be selected. Legacy configuration for customers who use a previous installation with a headset other than Jabra, Sennheiser or Plantronics. Headsets from these vendors are handled automatically and need not be configured. 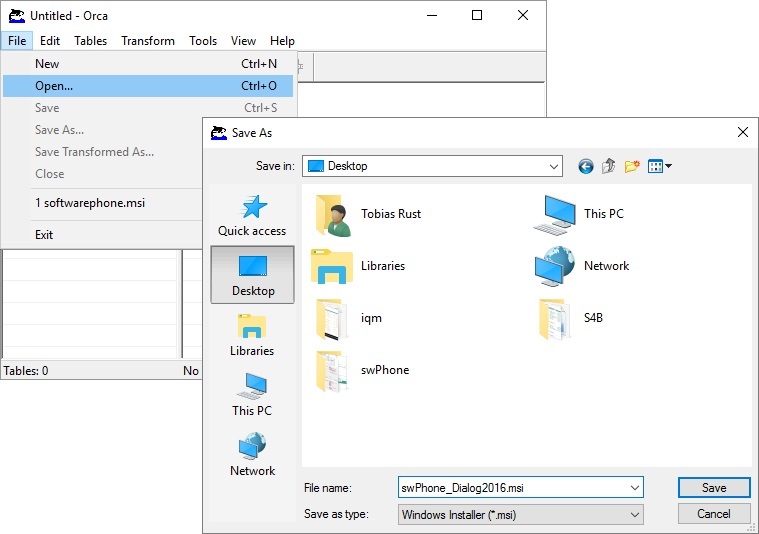 This config GUI is unique in the way that it can only be accessed (right click on the softwarephone icon) from the computer SoftwarePhone is running on. Here the typical End User Configurations are set: Audio and USB-headset parameters. 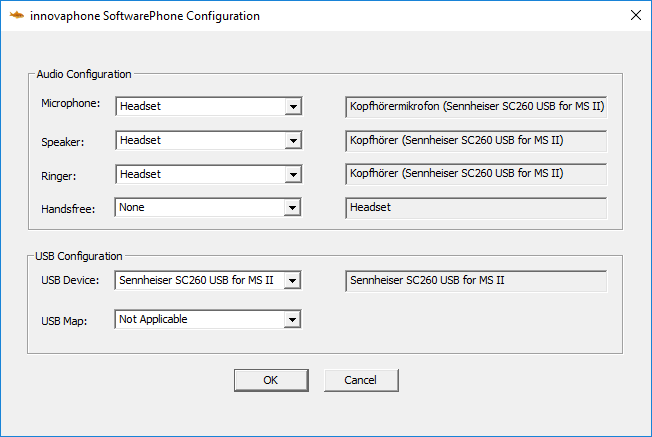 Above image shows the "Sennheiser SC260 .." configured as the prefered (USB Device) and being active. Note: If you have configured a specific headset and you don't plug it in but instead another one then this other is fully operational and it stays that way until the prefered one is plugged in, then it becomes the active one. The open listening device selection. The device that plays the incoming audio stream when the speaker button is pressed in myPBX. NOTE: If the headsets buttons do not work for call control, then call control is solely available through myPbx. Nevertheless the USB headset can be used as the audio-in/output device. Login: SoftwarePhone will be started when the user logs in (don't set this option if myPBX Launcher have option "Run Softwarephone" in the same PC). Default: Registration modes like the HW phones. NOTE: Anonymous registration might not work in all environments, especially those that prevent multicasts. For example, when using SoftwarePhone over a vpn connection ensure that multicast forwarding is guaranteed. Also, if a virtual machine is running on the same computer it might prevent multicasts being sent on the LAN. By default, when saving a database to a new file with File and Save As…, Orca does not copy streams that are embedded in the database but not a member of any table. Select Copy embedded streams during 'Save As' to save streams to the new file when saving a database using the File with the Save As… option. This method is particularly helpful when many USB headset of the same type are used. All Jabra, Plantronics and Sennheiser headsets that are supported by these vendors SDKs. Please check their sites for more information. Start a command window as Administrator and issue a "netstat –a –b > swphone_netstat.txt"
TCP 0.0.0.0:1720 LBU-VOSTRO-W7:0 LISTENING [softwarephone.exe]. Please search for other occurances of “1720” to ensure that no other processes listen to this port. If these events are no present in the trace it could be that the firewall settings prevent some of softwarephone’s functions. This could be the Firewall. should be your computers and the PBX’s @. Sometimes, Antivirus Packages can implement their own network access policy. This can result in a h323 release complete with cause “User Busy” to an incoming Setup from the PBX before any other softwarephone is reached. To see which process Sends/Receives the packets in a flow you can use the “netmon”, Microsofts free Packet tracer. Included in the installation path (C:\Program Files (x86)\innovaphone\SoftwarePhone) there is a tool called icollect.exe(accessible via start menu entry). After we reproduce a problem we can run this tool to generate debug files that are saved in the roaming folder (C:\Users\<User>\AppData\Roaming\innovaphone) as "debug-info.zip". NOTE: Please when providing a crash dump captured by icollect always use the latest SR (service release) of the softwarephone. Don't send us crash dumps of older versions since this will just take more time/effort to be analysed by our developer team. swphone_config.cfg -> one part of the config, can be used to check trace-flags. Wave-in/Wave-out: created when DSP & DSP Audiochannel & DSP Audiocapture are activated. After updating the driver, please reboot the PC even if not requested by the OS. Most cases are solved after updating drivers/software, especially if softwarephone won't start or no ringtones/audio device is automatically selected. The software phone does support G.711 and Opus codec only, no G.723 or G.722. Optionally we can use G729 if G729 Channel licenses are present and available on the PBX. Another program (e.g XCAPI) might be listening on tcp port 1720 as well. If you want to use both programs simultaneously you can change the signaling port of the softphone to another port like 1721. When using Innovaphone softwarephone with SIP Protocol no license it's obtained from the PBX. It's necessary to use H.323 always. Often it's reported that the Basestation of Wireless Headsets doesn't Ring on incoming call, this is a feature that is missing and there exist already a Feature Request for it - Alerting on Wireless headset base also . Please check the H.323/TLS Known Issues article. The software phone can only run once on a single system. This also implies that it does not work for terminals server systems such as e.g. Citrix, as only the first client session running on a server would be able to start a software phone. Furthermore, multiple RTP streams would impose quit a bit of load on the server. Also check that windows firewall is not blocking softwarephone communication. We noticed this behaviour on some Windows PC. This was due to the power management settings of Windows, that was turning off the USB ports to save power (this happen most on laptops) To avoid this, open "Control Panel" (with Category view) - "Hardware and sound" - "Power options" . Under "Preferred plan" click the "Change plan settings" for the plan you are currently using. 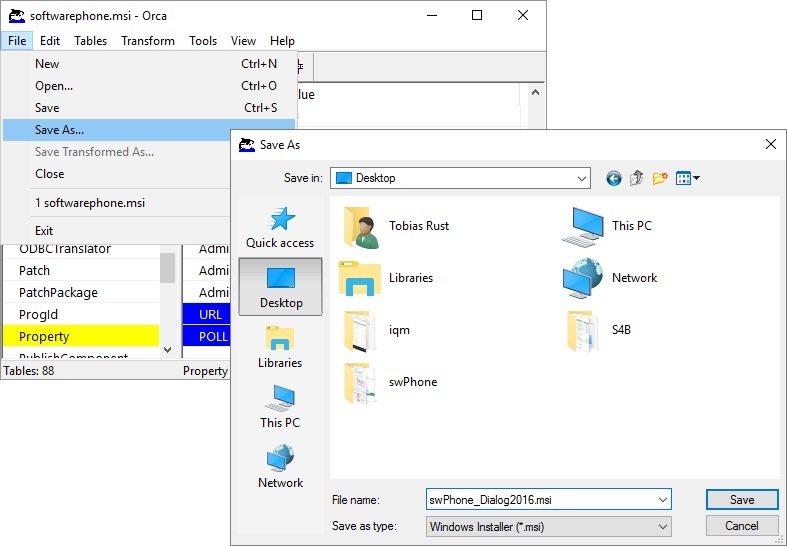 Click the "Change advanced power settings" link Expand "USB selective suspend settings" Select "Disabled" form the drop-down menu Click "Apply" and the "ok"
On windows 10 PC, can happen that after installing the new softwarephone version without manually uninstalling the old one, softwarephone won't start anymore, and in the Windows event viewer you will see the softwarephone app crash with relative ntdll.dll error. To solve this, manually uninstall the softwarephone, reboot the PC and install the new version. We noticed some issue between Softwarephone 12r2 and Windows 10. 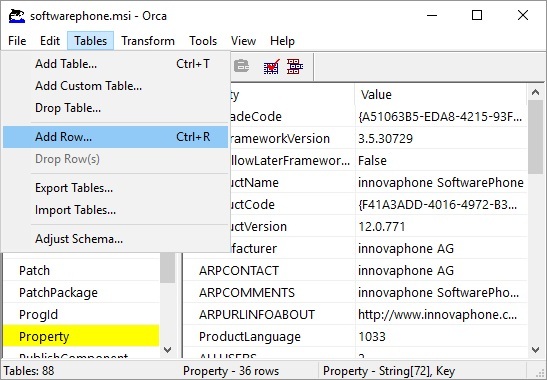 If your softwarephone after Windows 10 major update 1809, doesn't start or start and keep restarting, uninstall Softwarephone 12r2, delete the Softwarephone folder in the AppData/Roaming/Innovaphone/ path, restart the PC and install Softwarephone 12r1 with Administrator rights. This should solve the issue. Open "Run" by pressing Windows + R keys together. 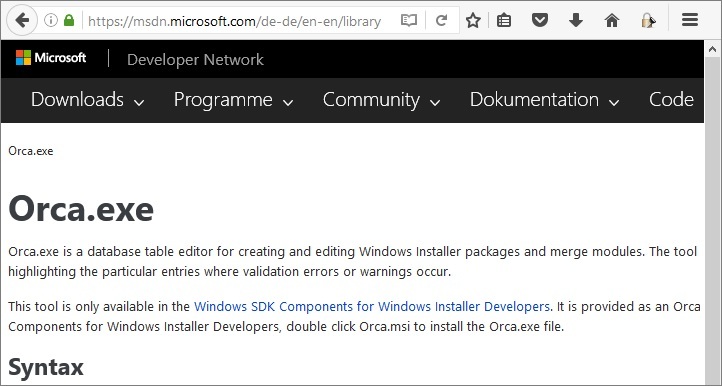 Type: as C:\Users\USERNAME\AppData Note: Replace C: with the letter of the drive where Windows is installed. Also replace USERNAME with the username of the account you’re logged in. Now softwarephone should be able to access all necessary files again. Sometimes if the softwarephone loose connection, wifi/copper/vpn will be switched or crashes the application in the system tray will not removed. This page was last modified 16:38, 17 April 2019.